The festival featured performances from Jerry Noble (Dayton Philharmonic, Wright State University), Jonathan Ovalle (University of Michigan), Michael Wood (University of Waterloo), Nicholas Papador (Windsor University), Jamie Drake (TorQ), and Michael Murphy (University of Toronto). Dr. Schutz gave a brief clinic discussing exercises for developing four mallet facility on the marimba, and then played two guitar transcriptions as part of a montage concert: Recuerdos de la Alhambra by Francisco Tárrega, and Prelude No 2 by Brazilian guitarist and composer Heitor Villa-Lobos. 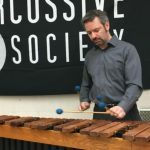 Nicholas Papador (President of PAS Ontario) hosted this Day of Percussion event, which brought together many members of the Windsor percussion community, as well as percussionists and enthusiasts from around Southern Ontario.